Happy Easter to all my Easter celebrating followers!!!! 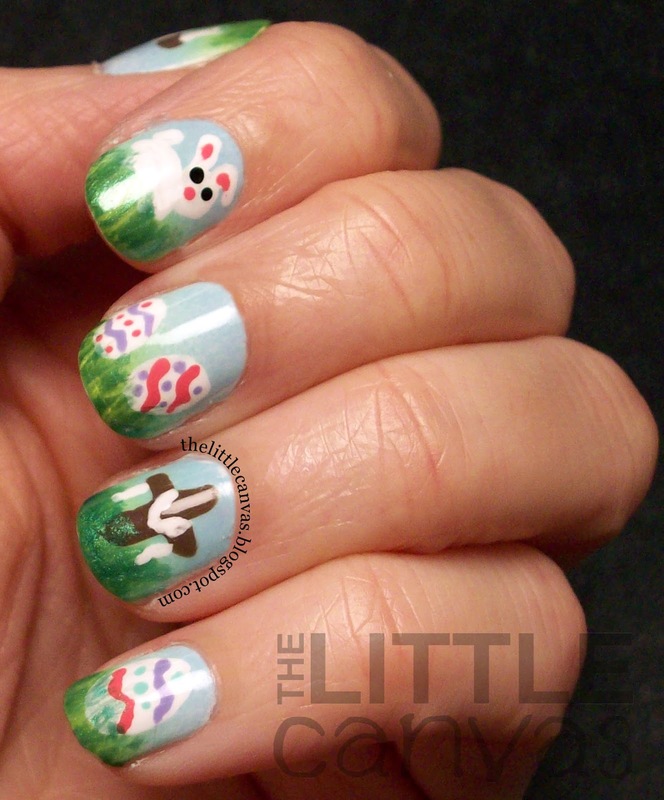 Are your nails Easter-y? Mine of course are!!!! I may have gone over the top, but I really feel like The Little Canvas again after this manicure! When I sat down to do this manicure, I had a clear vision in my mind of what I wanted to do. Lately though, the idea in my head never translates onto my nail. It always seems like everything works against me, and my canvases become easily destroyed after a few swipes. For an Easter manicure, I wanted to include some bunnies, Easter Eggs, and maybe some little flowers. Most importantly though, I wanted to include something which would be a reminder in regards to the true meaning of the holiday. If it weren't for Christ dying for our sins and rising with the promise to come again, there would be no reason to celebrate this holiday. As a Christian, it is a holiday I am truly grateful for, and I really wanted to incorporate my faith onto my nails, while including the other ideas which were floating around in my mind. I started with a blue to green gradient to resemble the sky to the grass. Since I painted on some HD Nails as a detail for grass on top of the design, the beautiful gradient I created was covered up. I purchased these new "Collagen Infused" make up sponges from Wal-Mart and boy, these sponges created the best gradient ever!!!! Literally, the polish transferred beautifully to the nail. I'm going to thank the collagen for this. On my middle and pinkie finger, I decided to draw on some Easter Eggs. 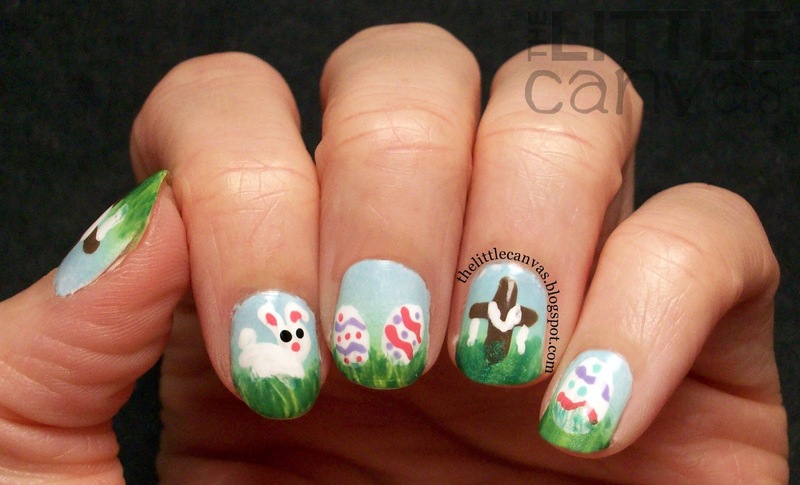 To do this, I drew on the eggs with a nail art brush, then added the details with my smallest dotting tool. 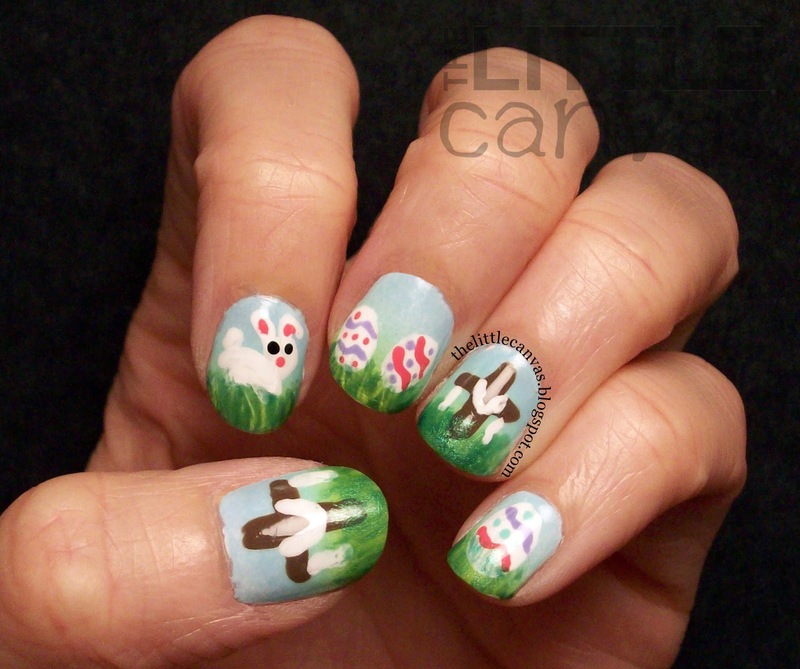 On my pointer finger, I painted on a bunny using my nail art brush. Kind of not happy with how he turned out, but overall he looks kind of cute. For my most important nails, the ring and thumb, I painted on the crucifix with the cloth draped over it. With Sinful Colors Nirvana, I used my nail art brush to paint on the cross shape. When it was dried, with the same brush, I painted on the cloth using the white polish. When all designs were dry, with my nail art brush I used HD Nails and painted on some grass-y details. Again, kind of sad that it covered up the Sassy green that the gradient blended to. You can sort of see the gradient on the middle finger between the eggs. I'm so proud of this manicure. I feel that I have come a long way, seeing as if I tried this last year, it would have been a huge failure. I am genuinely surprised that these are the first religious themed nails I've seen-I would have imagined crosses on a hillside at least! I'm not religious but I can recognise that for a lot of people this is a very important festival, so I'm surprised that so few people seem to have shown it in their nail art! You've done a lovely job with these, they're really pretty! Thank you so much!!!! I saw only one other manicure on Instagram which incorporated the true meaning. It is important to have it represented! I'm surprised also. as you know, i'm from Panama. and because we have north american presence for many years, we commemorate a lot of holidays that comes from the US (for example, the 4th of july. i dont understand that, because we have 2 independence days of our own.. but meeh).. so the easter bunny is something that we picked from the US, i think is sad how, taking into consideration that the Republic of Panama has catholicism as its official religion, people instead of celebrating the resurrection of the Lord, spend all day looking for easter eggs on the grandma´s yard. Just Saying. Haters gonna hate. whatever. these are the first nails that has something religious in it, i'm glad you took into consideration. 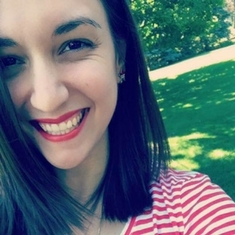 without Jesus dying in the cross for our sins, guess who will be looking for easter eggs..
i really liked your nails, my favorite ones!